If you’re home from work for the holidays with guests dropping by, here’s a very easy seasonal bundt cake recipe. It freezes well, so you can stick it in the freezer and cut slices whenever you need them. It’s a delicious alternative to coffee cake, and a homey cake to bake for friends. What makes it so easy is starting with a cinnamon bundt cake mix. 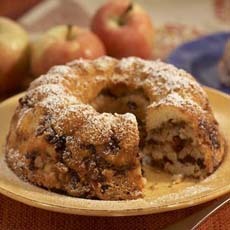 The best one we’ve tried is the Cinnamon Streusel Bundt Mix from Nordicware, makers of the bundt pan. At $15 a box it isn’t inexpensive, but it’s as good as homemade. As an alternative, Krusteaz and Betty Crocker have a mix for $2.50. For a seasonal touch, Chef Tom Fraker of Melissas.com added dried cranberries; we added pecans. For a fancier dessert, you can drizzle the slices with butterscotch or caramel sauce and garnish with whipped cream or mascarpone. A cinnamon streusel bundt, loaded with seasonal cranberries and pecans. Photo courtesy Melissas. *You can substitute the more tart Granny Smith or the more sweet Empire apples. All three hold their shape when baked. 1. PREPARE the cake batter according to package instructions. 2. TOSS the diced apples in flour and shake off the excess. Fold the apples, cranberries and pecans into the cake batter. Bake the cake as directed on the package. 3. DUST the cake with powdered sugar right before serving (otherwise it will absorb into the cake). Place the sugar in a small sieve (mini strainer), hold it over the cake and tap it to dust the top.